Great captures Pat!! 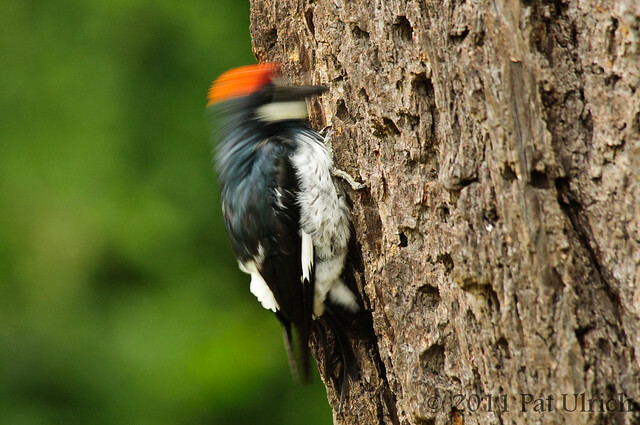 Blurring with woodpeckers is a problem. Boom & Gary of the Vermilon River, Canada. I checked out all of your Point Reyes photos, Pat. Lovely sets of shots. I am looking forward to more fun excursions there. 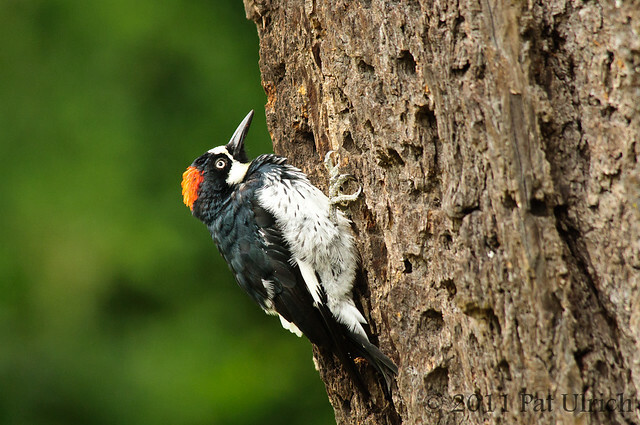 Fun shots of the woodpeckers. 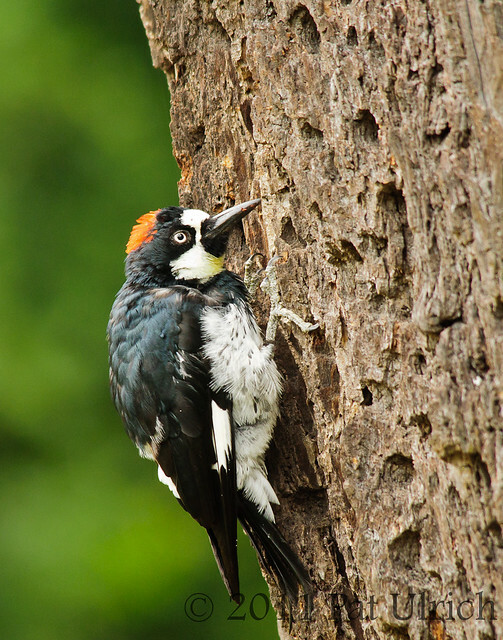 What a beautiful Woodpecker! And that tree looks like a feeding place to woodpeckers. I can sympathize Pat. I've been there. The same holds true for a spare battery. Great shots. It is always good to get something when you luck into a rare sight. Fantastic post and photos Pat! I've done the same thing, leaving the extra CF cards somewhere just out of reach and even left them at home. I use a camo cover for my long lens and slip a spare card in the cover so I never find myself without a card. Wow, these are superb images Pat. Oh Pat, he is adorable....I love the speed shot, too (he's a blur). Close is right, your stealth is great, any closer and the birds in your lens. Amazing detail Pat! I think the worse mistake is the one I'm making at the time. The list of things that can go wrong is long and wide, but the one mistake you don't want to make is not going out at all! Great images of a lovely bird. Wow, fantastic set of photos, and I love the effect in the last one! OH boy been there on the left behind Camera CHIP--hate that but you have some excellent shots..LOVE that WHITE eye came out perfectly! The BLUR really does show the speed at which these guys can drum up a meal! Great sighting and photos. I just love this woodie, the eyes are cool. Oh my gosh! I think you captured enough great photos! I'd be happy! this is an awesome bird! I love the one with it's head upside down . . . Thanks, Gary! They do move quick, especially as they peck away at the bark! Thanks, Jen! I'm glad you enjoyed my Point Reyes galleries -- I'll be looking forward to your posts about what you see there! Thanks, dreamfalcon! That is one of their "granary trees". A family unit will control a few trees in an area (sometimes telephone poles too) and they'll cover the entire thing in holes like that. Then they pack acorns into the holes to save them for later. A fascinating bird for sure! Thanks, Mike! I agree -- that's really cool about woodpeckers. Thanks, Jim! Definitely true for batteries as well. In some ways, at least you can delete shots off of the card (time consuming, but doable) but if the power is gone, you're sunk! Thanks, Bill! I was definitely excited to see this bird just 5 or 6 feet of the ground, the first time I've ever witnessed one that low. Thanks, holdingmoments -- I'm glad you enjoyed them! Thanks, Carol B.! They are a really cute species! Thanks, Carol M.! They are somewhat unique with their yellow face and splash of red on the head. Thanks, Springman! And very astute comment -- I'd rather make mistakes in the field than not be out there! Thanks, Joo! I'm glad you like the motion one. I'm still undecided on it. Thanks, Sondra! They sure do move quick when they're poundng away! Thanks, Barb! I'm pleased with these, but I do wish I had some vertical shots that weren't cropped so much. 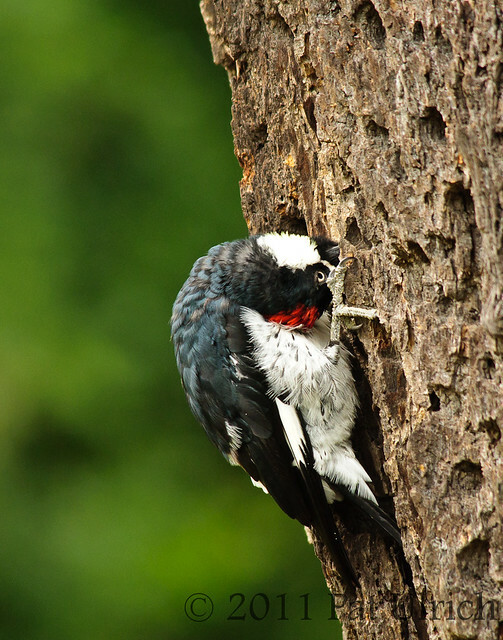 You got some great shots of this busy little Woodpecker! I even like the blurry head shot. Thanks, Carletta! It is interesting to see how they spread out their feet to hang on like that! Marvelous images, Pat. Strange looking bird, looks like a clown with his black mask. Glad you got these shots. They made me smile this morning.